Every December Truth In Aging chooses to honor some of the amazing anti-aging products that have delivered unparalleled results throughout the year. The Truth In Aging Best Of Awards is now a hotly anticipated event by both our community members and our carefully-curated brands. The treatments, serums and creams we award not only meet our strict standards — innovative, ethical, good for the skin — but are also proven effective by tough critics (aka real women and men like you). We’ve awarded some seriously innovative formulas over the past two weeks, but human stem cells remain the biggest breakthrough in topical skin care. Human stem cells have the unique ability to control cellular formation, replacing damaged or diseased cells as necessary. Recent research supports the concept of topical protein derivatives aiding in skin repair, which is important because our stem cell potency decreases as we age. Lifeline Stem Cell Skin Care Daily Defense Complex uses powerful concentrations of peptides derived from pluripotent non-embryonic human stem cells, along with potent antioxidants and enzymes, to fight off visible aging. “This is my most cutting-edge find of the year,” says Marta. Human stem cells have been primarily harvested from adults or from circumcised infant skin. Lifeline Skin Care, through its parent company International Stem Cell Corporation, is the first company in the world to create human non-embryonic stem cells from unfertilized eggs — the same stem cells active early in life — and, more importantly for us, how to take extracts to include in anti-aging creams and serums. Lifeline scientists discovered that human non-embryonic stem cell extracts are more powerful than adult stem cells when it comes to improving the look of fine lines, wrinkles, age spots and sagging skin. Lifeline uses a targeted delivery system in which the stem cells are encapsulated in liposomes and released on cell membranes over an extended period of time. This ensures the proteins remain active and therefore effective. Daily Defense Complex also includes antioxidants, such as algae extracts, argan stem cells and niacinamide, and ultrasomes to protect against the environmental damage that causes premature aging. Ultrasomes are DNA-repair enzymes that have the ability to recognize UV damage and accelerate healing. “I have been extremely pleased with my experience with Lifeline Daily Defense Complex. My skin is looking very smooth and glowing, and there is a definite impact on wrinkles, especially my forehead lines,” Marta reported in her initial review of the product. “This is one stem cell serum worth finding!” Suitable for all skin types, this professional-strength serum can be used on both the face and neck daily. 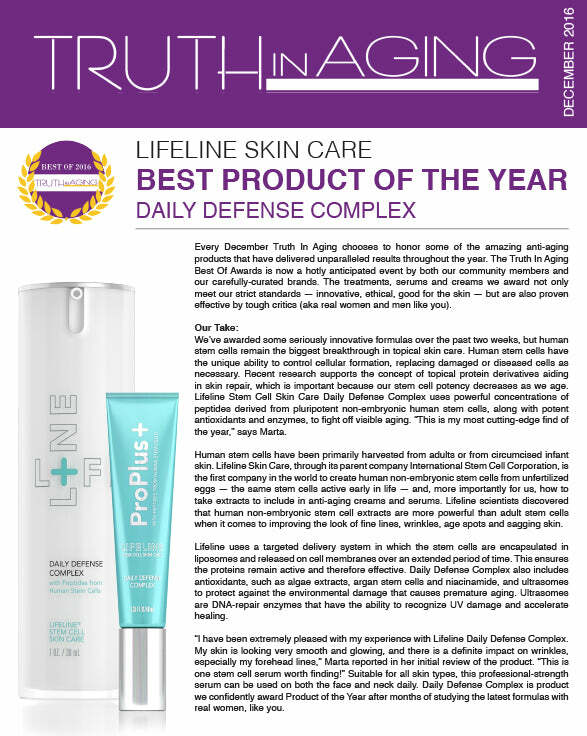 Daily Defense Complex is product we confidently award Product of the Year after months of studying the latest formulas with real women, like you.